We’ve officially gotten through the worst of Houston’s hot and humid summer, but I’m sure many of you are still enjoying the luxury of a great air conditioning system as we creep info fall. You can have a great HVAC system, but it only goes so far without proper insulation. We’re dropping some knowledge on how we handle insulating our homes to ensure it’s as energy efficient as possible to keep your home’s temperature regulated all year long. Insulation is installed after the house is framed and sheathed, and after all of your electrical, low voltage and plumbing rough-in has all be completed. Every home we build is insulated with open cell spray foam insulation as it is much more effective than traditional batt insulation (or the pink fluffy stuff you’re used to seeing). 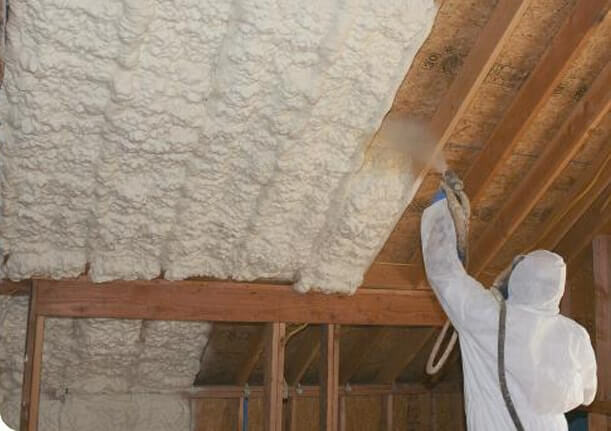 The process of spray-foam insulation is quite mesmerizing to watch, but because the foam formula is powerful, it’s important to stay out of the home for at least 24 hours after it’s installed. We mix in a fire-retardant into the spray foam before applying it on all of your exterior walls, your attic and roof. The technicians suit-up in protective gear to spray the foam in. As you can see below, the foam is flat at first and then slowly expands to fill in the space between the sheathing and framed. The spray expands anywhere from 3.5-5.5 inches and any overhanging foam is shaved down before the sheetrock is installed. You may be surprised to hear that not every wall in your home has insulation in it. Typically, insulation is only needed on exterior surfaces; however, it’s common for us to recommend insulating the walls around your master bedroom, utility room and even game rooms with batt insulation as a sound barrier. For any space that generates noise, or a space you’d want to be protected from outside noise, insulation can be installed as a sound barrier. There are various levels of sound barrier insulation if you need the space to be mildly or ultra soundproof. When spray foam insulation is installed in your attic along the roof line, you don’t need additional insulation on the floor in the rafters. You may notice that the foam along your attic’s room is pretty thick. That’s because we apply a thicker layer of foam along the roof for extra protection. If you have a crawl space foundation, we install a layer of closed cell spray foam insulation along the bottom of your floor. This insulates the bottom layer of your home as it is exposed to the elements. Insulation is an essential component of keeping your house cold in the summer and warm in the winter! Without the protective barrier, your home’s internal temperature (among other things) would be at the mercy of mother nature. Be smart and insulate well!